"41AN2-40, Burial F-2" by Timothy K. Perttula and Robert Z. Selden Jr.
DECORATION: There are 10 diagonal engraved panels repeated around the rim. Each panel has two diagonal engraved lines with hatched pendant triangles. The panels are enclosed within upper and lower horizontal engraved lines under the lip and at the carination. Poynor Engraved, var. 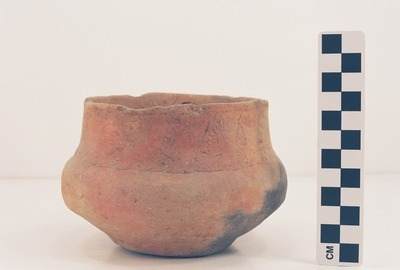 T carinated bowl (Vessel 41AN2-40).